Find New Recipes – Search our online database of over 3,000 beer recipes directly from your phone or tablet. If you find one you like you can save it locally to your phone or to your cloud account for easy desktop integration. View your Desktop Recipes On The Go – You can easily view your recipes on the go using the BeerSmith cloud folder and BeerSmithRecipes.com. 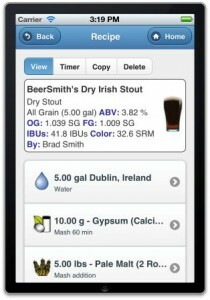 Copy a recipe to your cloud folder on BeerSmith desktop and you can open it from your phone or tablet. (Note: BeeerSmith Lite does not include recipe editing). 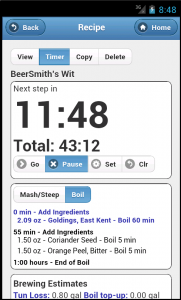 Time Your Brew Day – A full brewday timer for your phone or tablet provides both steep/mash and boil timers with step-by-step brewday instructions. In addition, all of the critical estimated data (IBUs, OG, Volumes, fermentation, aging) is displayed on the timer page for easy reference while brewing. Also watch for the “full” version coming soon! – In a few months we plan to have a “full” BeerSmith app which will allow recipe editing and creation (the lite version does NOT allow recipe editing). Get it on the Apple App (iPhone/iPad) Store! Buy it on the Google Play (Android) Store! Buy it on the Amazon (Kindle Fire) App Store! 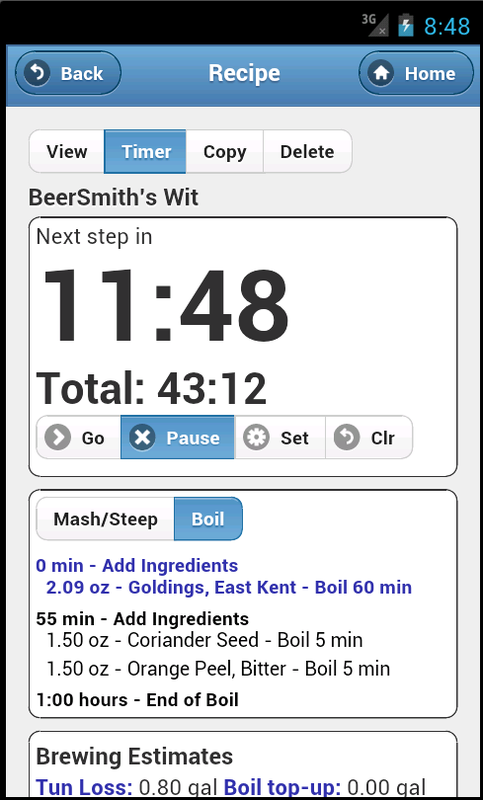 The “lite” version is intended as a companion application, recipe finder and brewday timer for BeerSmith on the desktop. Unlike the full version (which is still in development and a few months away from release), the lite version does not allow recipe editing. 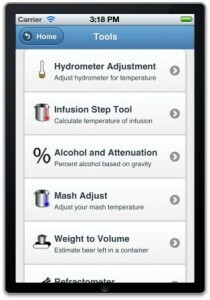 However, the lite version is still packed with features including the ability to search, browse and download recipes from our BeerSmithRecipes.com sharing site, access via the internet to your cloud folder which lets you take recipes with you on the go, and a detailed brewday timer so you can use it while brewing your beer. It also has a brewing reference, series of standalone tools and unit converters. 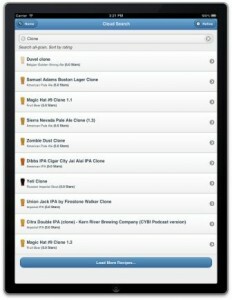 We’ve tested BeerSmith Lite on a wide variety of Android devices (phones and tablets) as well as iPhones and iPad. It runs well on Android 2.3 or higher and IOS 5.1 or higher. The application layout is identical on all platforms in the initial version, though I may further customize tablet layouts in the future. One of the main reasons it took so long to get a mobile version of BeerSmith published, is that I wanted to complete the BeerSmithRecipes.com cloud service first so you would have an easy way to access recipes created on your desktop from your phone or tablet. I’m happy to say that this is precisely the case for with BeerSmith Lite. If you add a recipe into your cloud folder on your desktop version of BeerSmith, and then refresh the cloud view on your mobile device the recipe is instantly available on your mobile device. From there you can copy it to local (offline) storage on your device or directly access the brewday timer. I’ve added a search page so you can search thousands of recipes available now on BeerSmithRecipes.com directly from your phone or tablet. BeerSmithRecipes.com, which I launched in May now has almost 3,000 shared, recipes, over 9,000 users and some 17,000 recipes stored online. Type in “Irish Red” and you can quickly locate the top rated Irish Reds. If you find one you like, you can copy it directly to your local storage or cloud folder for later reference. Its a great way to find new recipes on the go or have a few minutes at work and want to find new brown ale recipes. A lot of people asked for the ability to take their desktop brewday timer with them. So I started by duplicating that function on the mobile app. You can drop a recipe into your cloud folder, walk out in the garage and open the brewday timer for it on your phone. The timer shows you step by step mash/steep and boil instructions and also plays an alarm as each new step is reached. The beta testers asked for more – so I also included just about all of the data that appears on an average brewsheet in compact form on the timer page. This makes it easy to compare your expected volumes and gravities against the estimated values, and also provides a reference for later steps like aging and carbonation. The lite app also includes a suite of 7 handy brewing tools for common functions like determining alcohol content, converting a refractometer reading or adjusting your mash temperature. I added unit converters for volume, weights, temperature, and OG to perform those functions. Also the new mobile app has a brewing reference with a full beer style guide and also the most common beer ingredients – so you can have that in your pocket while on the go as well!